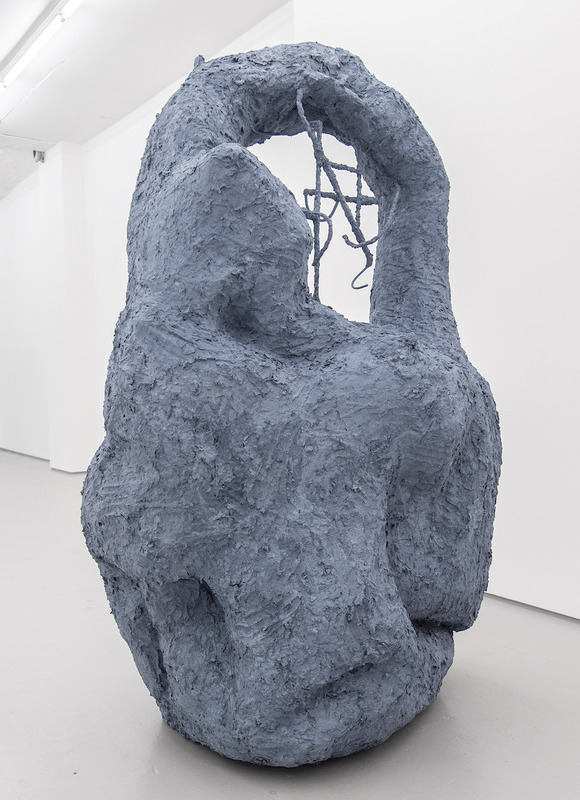 Surface Matters at Fold Gallery this month is a two-person exhibition of sculpture by Danish artist Ellen Hyllemose and British artist Olivia Bax. An intimate presentation, it allows for an exchange between the artists that is intentionally exposed and raw, leaving little of the commonalities and divergences hidden. Of course, Olivia Bax is interested in the balance between planning and spontaneous making, between mass and detail. Her work considers how we view sculpture in relation to our wider built environment. All the pieces in Surface Matters start with a steel armature. There is no preconceived plan; the steel is a freehand drawing in space. But it also has a function. Like a traditional armature, it is the core and the framework on which to build. The steel armatures are covered with chicken wire, paper-mâché and paper pulp. An area of the armature (usually the most detailed section) is deliberately exposed. These different layers dictate the tempo of making in the studio, varying from the laboured, intricate steel framework to an impulsive cladding of chicken wire and then a fast application of paper pulp surface. In the free-standing works Rumble and Roar, the first observation is form, colour, scale and their almost cartoon-like quality. The openings are like windows. Through the gap, we see the armature, a series of lines, like a drawing. Then we see through the linear to the work and space beyond. Ellen Hyllemose’s sculptures, meanwhile, are about surface and both external and internal space. The fabric surface is worked in and on, from behind and through. The artworks are hollow and the possibility of looking inside them makes the coloured fabric the focus for defining space, the space behind the surface.